In the course Essential Aqua Pilates, the goal is to develop correct breathing technique, body awareness, body alignment and body placement throughout the execution of the exercises. The results are an improved core strength, control, stability and flexibility. All these benefits are crucial in order to transition to the next level of aqua Pilates. Learn the six principles and mind body concepts of Pilates Exercise. 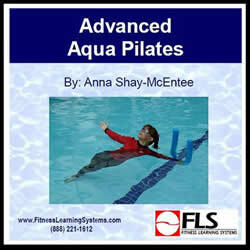 Learn benefits and safety guidelines for advanced aqua Pilates practice. Identify general recommendations for teaching Aqua Pilates. Understand recommendations for advanced aqua Pilates class design. Learn, view, and practice Advanced Aqua Pilates Warm-up exercises. Learn, view, and practice Advanced Aqua Pilates Core Exercises. Learn, view, and practice Advanced Aqua Pilates Cool-down exercises.